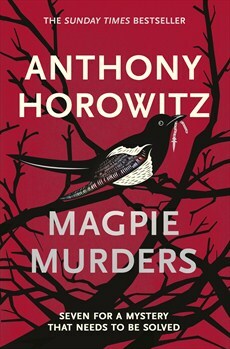 In his latest book Anthony Horowitz tries have several cakes and eat them all. The fictional work Magpie Murders is an Agatha Christie-style golden age detective novel that is embedded in a novel that is itself a bit of a homage to golden age detective novels. And while being two murder mysteries in one, it is also both a critique and a celebration of the public’s love of cosy English-style murder mysteries. All of which is no surprise coming as it does from the pen of the author who brought us on TV the likes of Midsomer Murders, Foyle’s War and Poirot and recently in novel form loving reconstructions of Conan Doyle (House of Silk and Moriarty) and Ian Fleming (Trigger Mortis – reviewed here). Novelist Alan Conway has delivered his ninth Atticus Pünd novel to his publisher. As we learn in the cute frontpieces to the novel in the novel, Pünd is a famous literary detective in the mould of Miss Marple, Hercule Poirot and Lord Peter Wimsey. We get an introduction from Susan Ryeland, the editor of Magpie Murders, before the first six parts of the novel, a murder mystery set in the quaint English village of Saxby-on-Avon. The sixth part ends before the mystery is solved leaving both Susan and the reader in suspense. Susan then learns that Alan himself has committed suicide, complete with compelling suicide note. In her search to find the final chapter of the Magpie Murders manuscript she begins to suspect that Alan’s death itself may not be all that it seems. Horowitz clearly loves Agatha Christie and was desperate to write a Christie-style novel without being accused of just mimicking her. So he creates both Conway and Pünd and gives the punters what they so clearly want: an English village, two deaths, including the death of someone that every villager had a reason to hate and an inscrutable slightly foreign detective who makes gnomic observations that turn out to be true. Later, just in case the reader missed them, one of the characters in the “real world” lists the multiple Christie homages there are not only in the Conway’s Magpie Murders but in his previous Pünd adventures. And when the music stops, Horowitz gives readers a modern version of the cosy mystery with a different victim who many people had a reason to want to kill and a second set of suspects who were all slightly echoed in the original text. And through this second part, criticisms of the form – the complete lack of real character development, very little in the way of any political or social subtext, and the overly complex plots, the fact that it is considered to be ‘real literature’. But none of these criticisms prevent Horowitz delivering exactly that… twice. While it at first appears that this might be reinventing or reinvigorating this sub-genre of crime, this is just homage. Horowitz finds himself going through the same motions – murder, range of suspects all of whom have a motive, critical clue, reveal. The only difference is that Atticus Pünd seems to know the answer pretty much from the get go while Susan takes a little longer to get to her solution. People who love the golden age of detective fiction, who, as Susan puts it, like to curl up with a cosy mystery when it is raining outside knowing that everything will be explained at the end, or who spend their Friday nights in Midsomer (a place which gets named checked far too many times in this novel) will love Magpie Murders. But those who are looking for something original in their crime fiction should look elsewhere.